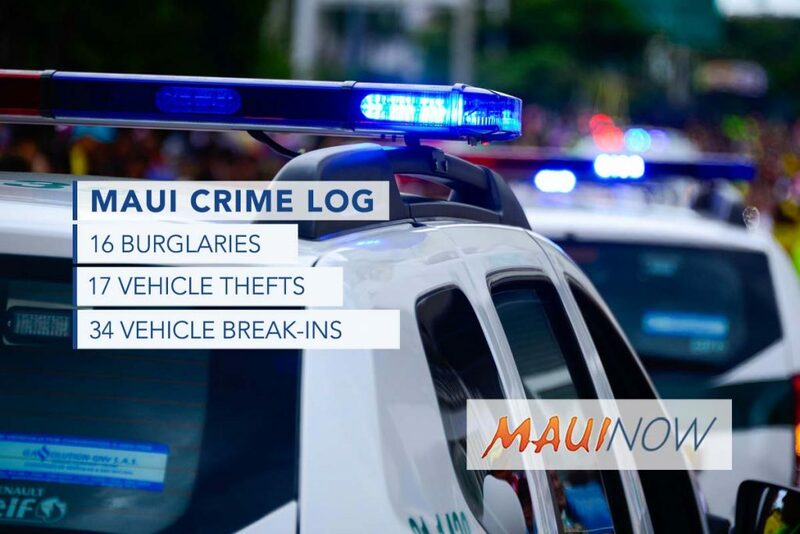 Maui Crime Log for March 31 to April 6, 2019. 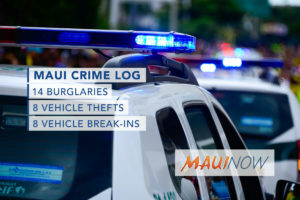 Maui police responded to 10 burglaries, 20 vehicle thefts and 22 vehicle break-ins in Maui County over a seven day period from March 31 to April 6, 2019. Burglaries were down while vehicle thefts and vehicle break-ins increased from week before levels. Burglaries were down -47% from the week before when 19 incidents were reported over the seven day period. Vehicle thefts were up +81% from the week before when 11 incidents were reported; and vehicle break-ins were up +29% from the week before when 17 incidents were reported. Tuesday, April 2, 8:41 a.m.: 14000 block of Hāna Hwy, Hāna. Residential, unlawful entry. Tuesday, April 2, 5:57 a.m.: 440 Alamaha St, Kahului. Non-residential, forced entry. Tuesday, April 2, 8:50 a.m.: 300 block of Lono Ave, Kahului. Residential, unlawful entry. Tuesday, April 2, 11:09 a.m.: 300 block of Ani St, Kahului. Residential, unlawful entry. Tuesday, April 2, 1:42 p.m.: 100 block of Kupuna St, Kīhei. Residential, unlawful entry. Saturday, April 6, 1:52 p.m.: 2500 block of S Kīhei Rd, Kīhei. Residential, unlawful entry. Tuesday, April 2, 3:49 p.m.: 800 block of Kelawea St, Lahaina. Residential, unlawful entry. Saturday, April 6, 7:56 a.m.: 400 block of Hōkiokio Pl, Lahaina. Residential, unlawful entry. Tuesday, April 2, 12:20 p.m.: 900 block of Naha St, Lānaʻi. Residential, forced entry. Wednesday, April 3, 10:03 a.m.: 3200 block of ʻIolani St, Pukalani. Residential, forced entry. Saturday, April 6, 10:48 a.m.: 1700 block of Kauhikoa Rd, Haʻikū. 2012 Kaitong Taizhou CL, red/black. Friday, April 5, 4:17 a.m.: 180 Nohea Kai Dr, Kāʻanapali at Hyatt Residence Club. LJL189 2019 Chevrolet Camaro, white. Sunday, March 31, 8:26 a.m.: 200 block of Alamaha St, Kahului. MJE007 2002 Lexus IS300, silver. Monday, April 1, 6:02 p.m: 300 block of Molokaʻi Akau St, Kahului. MJZ166 2003 Toyota Tacoma, white. Saturday, April 6, 8:15 a.m.: 100 block of Kauhaʻa St, Kīhei. 385MDN 2018 Ford F150, tan. Wednesday, April 3, 10:40 a.m.:15 Ipu Aumakua Ln, Lahaina at Ka Hale A Ke Ola O Waineʻe. LHA664 2017 Buick Verano, black. Saturday, April 6, 9:14 a.m.: 1221 Honoapiʻilani Hwy, Lahaina at Lahaina Cannery Mall. 302MVJ 2005 Honda VTX 1250R, silver/black. Saturday, April 6, 9:14 a.m.: 1221 Honoapiʻilani Hwy, Lahaina at Lahaina Cannery Mall. MEH221 1998 Nissan Frontier, silver. Tuesday, April 2, 12:52 p.m.: 4400 block of L Honoapiʻilani Rd, Nāpili. M02077 2018 Sanyan, red. Tuesday, April 2, 3:05 p.m.: 3740 L Honoapiʻilani Rd, Nāpili at Maui Lani Apartments. 049MVN 2008 Suzuki DRZ 400, black. Friday, April 5, 5:26 a.m.: 360 Pukalani St, Pukalani at Pukalani Golf Course. 2015 Club Car Precedent, white/black. Friday, April 5, 5:26 a.m.: 360 Pukalani St, Pukalani at Pukalani Golf Course. 2006 Yamaha G22, white/black. Saturday, April 6, 3:25 a.m.: 360 Pukalani St, Pukalani at Pukalani Golf Course. 2014 Club Car Precedent, white. 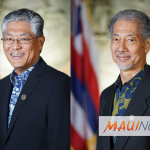 Sunday, March 31, 8:02 p.m.: 2290 Kāʻanapali Pkwy, Kāʻanapali at Hyatt. 1998 Toyota 4Runner, white. Sunday, March 31, 1:39 p.m.: 425 Koloa St, Kahului at Hi-Tech. 2008 Ford Ranger, white. Monday, April 1, 12:12 p.m.: 15 Hoʻokele St, Kahului at Zippy’s. 2017 Mazda6, red. Tuesday, April 2, 3:39 p.m.: 540 Haleakalā Hwy, Kahului at Costco. 2007 Ford Ranger, red. 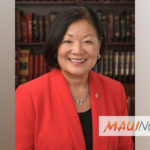 Tuesday, April 2, 6:07 p.m.: 11 E Kamehameha Ave, Kahului at Bank of Hawaiʻi. 2006 Ford Ranger, yellow. Wednesday, April 3, 7:43 p.m.: 540 Haleakalā Hwy, Kahului at Costco. 1999 Ford Ranger, white. Wednesday, April 3, 4:49 p.m.: Alaihi St / Hoʻokele St, Kahului. 1997 Ford Ranger, gray. Wednesday, April 3, 6:53 p.m.: 25 Kuhea St, Kahului at Bradley Pacific Aviation. 2003 BMW 5 Series, black. Thursday, April 4, 9:24 a.m.: 95 Kāne St, Kahului at Family Life Center. 2002 Nissan Altima, green. Friday, April 5, 6:52 a.m.: 100 block of Kapela Pl, Kahului. 2011 Toyota Tacoma, gray. Monday, April 1, 6:41 a.m.: 100 block of Hoʻonani St, Kīhei. 2005 Honda Civic, black. Tuesday, April 2, 9:41 a.m.: 255 Piʻikea Ave, Kīhei at American Savings. 2003 Subaru Outback, red. Friday, April 5, 9:42 a.m.: 851 S Kīhei Rd, Kīhei at Paradise Gardens Apartments. 2002 Subaru Impreza, green. Friday, April 5, 3:25 p.m.: 851 S Kīhei Rd, Kīhei at Paradise Gardens Apartments. 2018 Jeep Wrangler, white. Wednesday, April 3, 11:21 a.m.: 1840 Honoapiʻilani Hwy, Lahaina at Maui County Parks and Recreation Baseyard. 2008 Ford Eco Van, white. Monday, April 1, 5:34 p.m.: 399 Hauʻoli St, Māʻalaea at Haycraft Park. 2005 Honda Civic, gray. Thursday, April 4, 2:56 p.m.: 200 Halewaiū Rd, Waiheʻe Golf Course. 1998 Ford Ranger, black. Tuesday, April 2, 8:20 a.m.: 500 block of Kumulani Dr, Wailea. 2014 Ford F150, blue. Tuesday, April 2, 10:03 a.m.: 500 block of Kaleo Pl, Wailea. 2001 SUBARU FORESTER, white. Wednesday, April 3, 1:33 p.m.: Mākena Rd, Wailea at Maluaka Beach. 2017 Nissan Altima, silver. Thursday, April 4, 9:03 a.m.: 2000 block of Pakolu St, Wailuku. 2008 Nissan Altima, white. Friday, April 5, 8:25 a.m.: 1770 Mill St, Wailuku at Tasty Crust. 1999 Mazda B3000, white.